1. Decoration of the Battle at Copenhagen. - After this battle, in which the Danes fought bravely (though unsuccessfully), on the 2nd April, 1801, against the English, the King caused a Medal of Honour to be struck for those who had distinguished themselves in the affair. 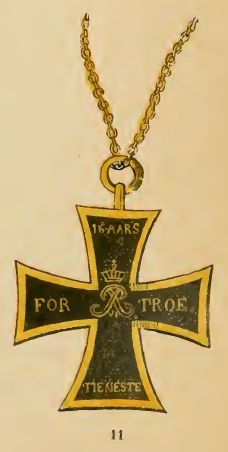 It was presented in gold to officers, and in silver to inferior grades, and was worn suspended by a red ribbon, in which is interwoven the Cross of Danneborg. 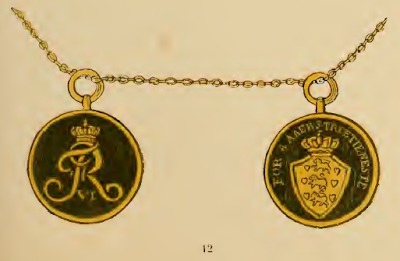 The obverse exhibits a lion standing upon the forequarters of a man-of-war, holding by one claw the arms of Denmark, with the inscription : "2nd April, 1801" while the reverse shows the royal insignia, crown, sceptre, and sword, with the inscription : "Kongen Foedrer, Faederlandet Skjonner" (The King honours, and fatherland is grateful). On the edge is impressed the name and grade of the recipient. The medal is seldom now met with, as but few of the owners are left among the living. 2. Medal of Merit at the Dockyards. - It was founded on the 29th January, 1801, by Christian VII, as a reward for the workmen at the royal dockyards, and for the encouragement of those belonging to the fleet. The same medal was subsequently, (4th September, 1814), distributed also amongst the sub-officers of the artillery, and the navy, inspectors of fireengines and dockyards, and all those engaged in the formation of nautical models. To be entitled to the medal, sailors, artillerymen, cannoneers, ship-carpenters, and other master-mechanics, or their chief clerks, must have completed their twenty-fifth year, while rope-makers, cabinet-makers, and others, must have been full thirty years in the royal service, before they can lay claim to the medal. 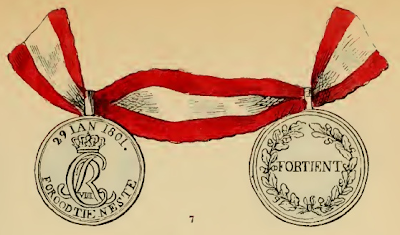 The obverse of the medal has the inscription : "For ood Tieneste" (For good services), and the reverse the word: "Fortient" (Merit). (No. 7). 3 and 4. Decorations for eight and sixteen Years' loyal Service. - Both (Nos. 11 and 12) were founded on the 23rd August, 1817, for sub-officers, and musicians of the band of the same rank. They are of bronze, and are presented at their re-engagement for another period of eight years. They are worn suspended by a small golden chain, the cross above the medal. 5. Medal of Merit of 1771. - This medal which is not allowed to be worn publicly, was founded by Christian VII. It is in gold and in silver. The front shows the effigy of the King, and the reverse two cornucopise (horns of plenty), surrounded by a laurel and oaken wreath, and with the inscription : "Pro Mentis" (For merit). 6. Medal of Merit of 1793, was founded by the same King, to reward and encourage inland industry and civil virtues. The front shows the effigy of the King, and the reverse the word : "Fortient" (Merit), within an oaken wreath. This medal, also, is not intended to be worn in public. 7. Medal for noble Deeds, founded in 1793 at the proposal of the College of Finance. The front shows the effigy of the King, and the reverse the inscription : "For Aedel Daad" (For a noble deed). 8. Medal for saving from Drowning, founded in 1812. It differs from the former only in the reverse, which shows within a wreath of water-lilies, the inscription : "Of Farens Fvaelg ferblomster Priis og Low" (Praise and reward blossomed forth from danger). As in the preceding case, the name of the recipient of this medal is also engraved on the edge. Since the 24th July, 1845, a new Medal of Honour for personal merit has existed in Denmark. The obverse represents the effigy of the King with the legend : "Christian VIII. Rex Danlse" while the reverse shows an oaken or corn wreath, within which is the word "Fortient" (Merit). On the edge is engraved the name of the recipient. When permission is given to wear it publicly, it is suspended by a red ribbon with a white cross thereon. In 1854, medals of military distinction were struck for sub-officers, or those bearing that rank. They are of bronze, and are worn suspended by a red ribbon, on which is a white cross. The medal is divided into two classes, each of which enjoys a pension for life of 30 and 15 thalers (905. and 455.) The first of which is obtained after sixteen, and the second after eight years' service.